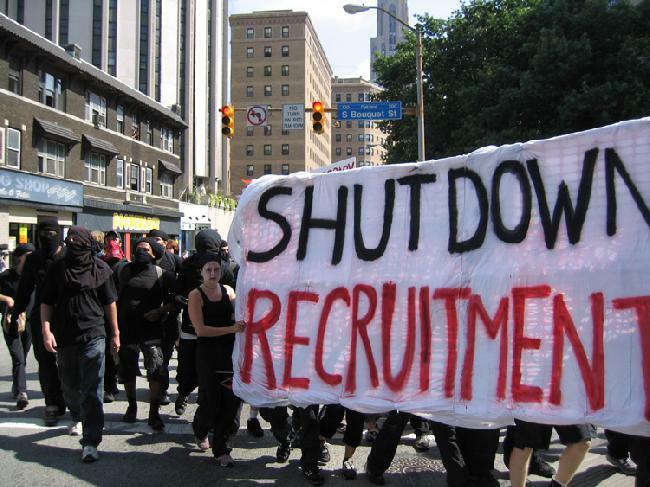 U.S. - Pittsburgh, Pennsylvania, U.S. - A counter-recruitment march aimed at Pittsburgh's main military recruiting station was dispersed by a police riot. Police tasered, pepper sprayed and beat anti-military demonstrators sending two women to the hospital. Among them were children, an elderly woman who was bitten by a police attack dog, and a man in a wheelchair who was knocked over. Six people were arrested in total. Police Sgt. Clint Winkler admitted that officers "started pushing the crowd" after commanding them to disperse. He said that the protesters were ordered to disperse because one of the demonstrators was involved in an altercation with a camera man working for the pro-military FOX News Network, who protesters say was acting aggressively towards them. The Army Recruiting Center on Forbes Avenue, in the Pittsburgh neighborhood of Oakland, has closed six times in recent months in response to anti-military demonstrations.